Filmmaker Anurag Kashyap's upcoming directorial "Manmarziyaan" will hit the screens on September 21. Filmmaker Aanand L. Rai, who is presenting the movie, announced the release date on Friday on Twitter. He shared a colorful poster of the film and captioned it: "'I don't want to die without a few scars'! This is how I define Anurag Kashyap and his brilliant actors on the journey of 'Manmarziyaan', Abhishek Bachchan, Vicky Kaushal and Taapsee Pannu! On September 21, meet the guts." The film stars Abhishek Bachchan, Taapsee Pannu, and Vicky Kaushal, who too shared the same poster. This is the first time Abhishek is collaborating with Taapsee and Vicky for a project. Taapsee captioned it: "An 'insane' ride is about to begin...'Manmarziyaan'"
Vicky wrote: "Fri-nally humara Friday aa gaya (Finally, our Friday has come)! 'Manmarziyaan' releasing September 21." 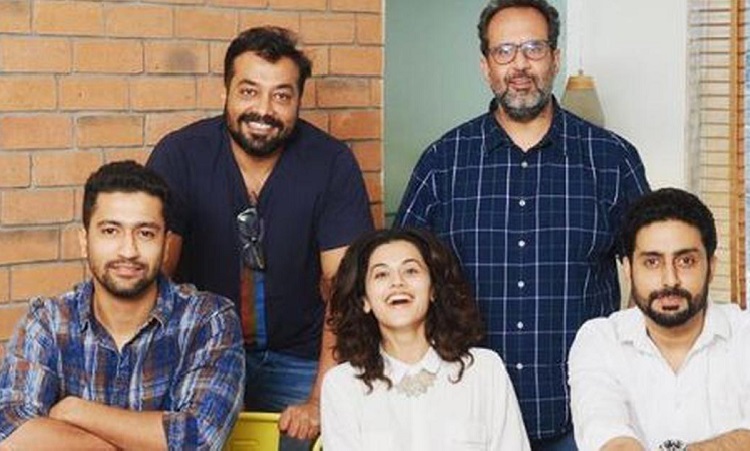 In an earlier interview to IANS, Taapsee had said "Manmarziyaan" is a beautiful mix of the different worlds of filmmakers Rai and Kashyap.